Avery nice rifle round for the very moderate price, considering the expenses that go into making belted magnum cartridges like the .300 Winchester Magnum. 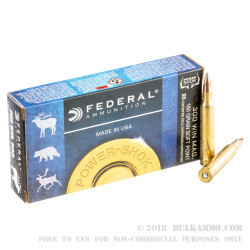 This is a great all-around hunting load for those larger game targets including Elk and Moose. It will also work nicely on larger deer but may be a bit too lightweight for most bear. The round itself is a very well-built factory load from Federal that eschews more innovation in favor of a really well-built cartridge based on a proven design: the soft point projectile. 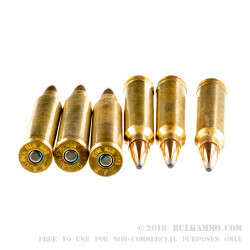 In the case of this particular round, this is a 180 grain soft point Speer Hot Core bullet and is known to perform on big game over the last several decades. 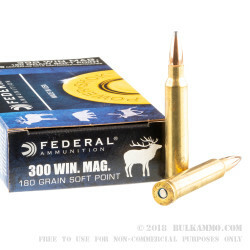 Relative to the high cost of most .300 Winchester Magnum loads, this is a bargain price for a cartridge that pushes out a 180 grain projectile at 2960 feet per second and offers 3502 ft. lbs. of energy at the bore exit. 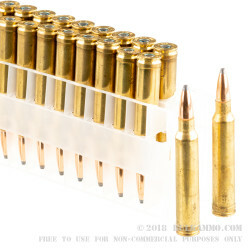 The Boxer priming and the Brass casing with the belted magnum base makes this a steal for the brass as a great choice for those who handload but also need some access to cheaper brass.